An Instagram post from a user named ninastegmaier (since deleted) appears to show what sure as hell looks like the next-generation Porsche 911, the 992. Like all 911 revisions, the aesthetic changes are fairly subtle and evolutionary, but this is clearly not the current 911. According to some sources, the photo was taken in Gersthofen, Germany, at the Porsche Zentrum Augsburg. The presence of such mundane details as rear parking sensors in the rear bumper and the little pop-off panel for the towing eye socket suggest that this is a production car and not some concept car design. This 911 design, if it does prove to be the next-generation 911, has some notable design developments, including a full-width taillight bar (something 911s have had a few times before), a redesigned rear air intake grille, and a high-mount center brake lamp that sort of looks like a tiny pair of skis mounted on the rear deck of the car. That air intake grille is also now visually combined with the rear window area, a new design approach for the 911. 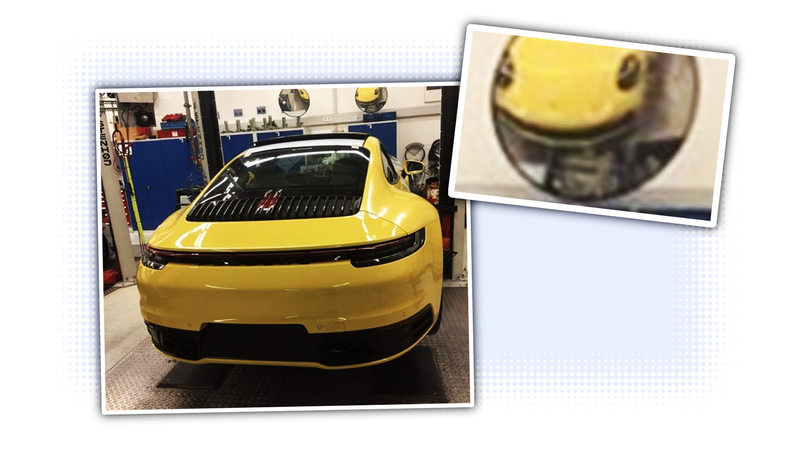 We can also get a hint of the front end of the new 911 by looking in the round mirrors above the car, and it still certainly appears to look like we generally expect a Porsche 911 to look, though it also resembles a friendly cartoon snake’s face. Of course, all of this could be a pre-production prototype of some kind, so grain of salt here. Reports and rumors have pointed to the Paris Auto Show in October as the reveal date 0f the 992. If this proves to actually be the car, the world is now seeing the new 2020 911 about nine months before Porsche would have liked. Sorry! That’s the internet for you.